Nitric oxide (NO) is an important biological regulator involved in numbers of physiological and pathological processes. Altered NO production is implicated in various immunological, cardiovascular, neurodegenerative and inflammatory diseases. As a free radical, NO is rapidly oxidized and there is relatively low concentrations of NO existing in vivo. It has been challenging to detect and understand the role of NO in biological systems. Cell Meter™ Fluorimetric Intracellular Nitric Oxide Assay Kit provides a sensitive tool to monitor intracellular NO level in live cells. 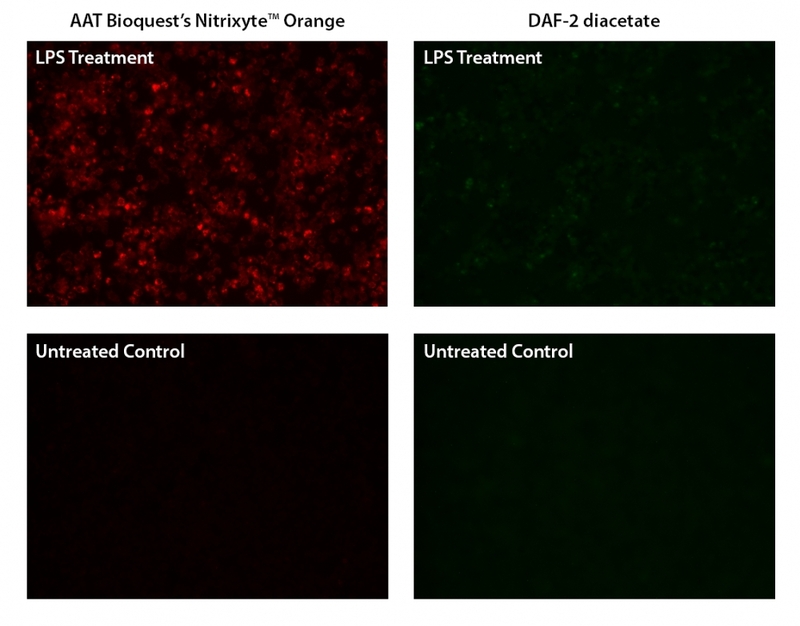 Nitrixyte™ probes are developed and used in our kit as an excellent replacement for DAF-2 for the detection and imaging of free NO in cells. Compared to the commonly used DAF-2 probe, Nitrixyte™ probes have better photostability and enhanced cell permeability. This particular kit uses Nitrixyte™ Orange that can react with NO to generate a bright orange fluorescent product that has spectral properties similar to Cy3® and TRITC. Nitrixyte™ Orange can be readily loaded into live cells, and its fluorescence signal can be conveniently monitored using the filter set of Cy3® or TRITC. This kit is optimized for fluorescence imaging and microplate reader applications. Thaw all the kit components at room temperature before starting the experiment. Add 20 µL of 500X Nitrixyte™ Orange stock solution (Component A) into 10 mL of Assay Buffer I (Component B) and mix well to make Nitrixyte™ Orange. This Nitrixyte™ Orange working solution is stable for at least 2 hours at room temperature. Protect from light. Note: 20 µL of 500X Nitrixyte™ Orange stock solution is enough for one plate. Add 100 µL/well (96-well plate) or 25 µL/well (384-well plate) of Nitrixyte™ Orange working solution in the cell plate. Co-incubate cells with test compound and Nitrixyte™ Orange working solution at 37°C for desired period of time, protected from light. Note: DO NOT remove the test compounds. For a NONOate positive control treatment: Cells were incubated with Nitrixyte™ Orange working solution at 37°C for 30 minutes. The working solution was removed and cells were further incubated with 1 mM DEA/NONOate at 37°C for 30 minutes to generate nitric oxide. Note: We have used Raw 264.7 cells incubated with 0.5X Nitrixyte™ Orange, 20 µg/mL of lipopolysaccharide (LPS) and 1 mM L-Arginine (L-Arg) in cell culture medium at 37°C for 16 hours. See Figure 1 for details. Remove solution in each well. Add Assay Buffer II (Component C) 100 µL/well for a 96-well plate or 25 µL/well for a 384-well plate. Note: DO NOT wash cells before adding Assay Buffer II. Monitor the fluorescence increase using microplate reader at Ex/Em = 540/590 nm (Cutoff = 570 nm) with bottom read mode, or take images using fluorescence microscope with a TRITC filter. Figure 1. Fluorescence images of endogenous nitric oxide (NO) detection in RAW 264.7 macrophage. Cells were incubated with AAT’s Nitrixyte™ Orange (Left) or DAF-2 diacetate (Right) at the same concentration, then treated with or without 20 µg/mL of lipopolysaccharide (LPS) and 1 mM L-arginine (L-Arg) at 37°C for 16 hours. The fluorescence signals were measured using a fluorescence microscope equipped with a TRITC (Left) or FITC (Right) filter set, respectively.